We’re taking a look at two innovative plugins from Imaginando, a Portugal based company that has been in the light for some of their iconic recreation tutorials of sounds from various dance music tracks. 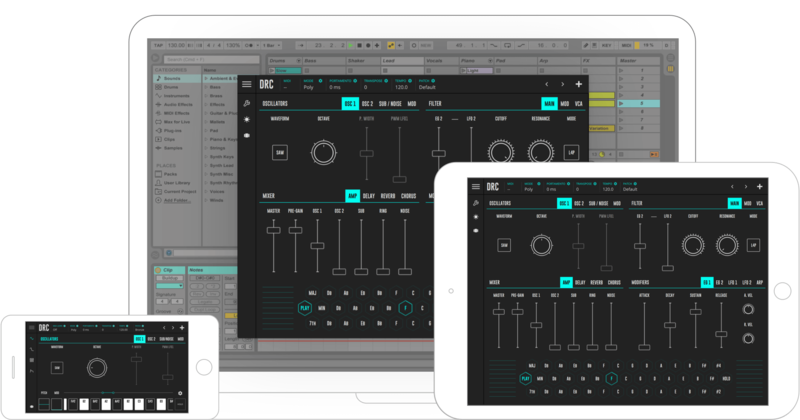 They also make a few other nifty iPad apps for Native Instruments Traktor Pro & Ableton Live. DRC is a fully featured subtractive polyphonic synthesizer from Imaginando that’s available on Mac OS, Windows , iOS and Android. A beast of a soft-synth with incredible sonic possibilities without compromise on audio quality. They’ve also got an intuitive way to playback notes from within the UI itself, with what looks like a ribbon style controller where you can play common chords or arpeggiated notes of the same. The good guys at Imaginando have worked really hard to make this synth pack a punch, the algorithm for internal sound summing seems to be of utmost quality bringing it closer to real analog synthesis than ever before. Moreover the fact that you can use the exact same plugin whether you’re on a Mac, PC, iOS or Android device makes it super versatile on the go. All your presets from any of these devices can be saved on the cloud for easy access from anywhere. DLYM is Imaginando’s latest FREE offering combining a free-timed delay with an LFO that does everything from subtle naturally timed delays to chorus/flanger type effects. It sounds really fresh and warm, very much deriving its characteristics from the DRC. Their YouTube Channel is filled with about 50 tutorials on how to make specific patches/sounds from popular tracks using nothing but DRC, a great way to learn the techniques of subtractive synthesis as well as to learn to use the plugin itself. As a bonus goodie, we’re giving away a FREE full length project made with Ableton Live 10 using DRC as the main source of sound + DLYM on a return channel. A final few words to conclude, what’s really appealing about DRC is that the sound quality is actually comparable to an analog synth, it’s definitely the closest you can get to one in case you don’t own one yet. The interface does away with any clutter, a total visual treat and is put together in a simple, straight forward manner. And it works exactly the same way on multiple platforms (Mac, Windows, iOS, Android) which makes it all the more fun to make your favourite patches while you’re on the go and recall it in the studio to fit into your productions. It’s free to try as long as you’d like, although you can’t save your patches. On Mac OS or Windows, you can buy a copy of DRC for €89 or ₹8,000. Install on upto 5 computers. A €11 in-app purchase if you’re looking to get the iOS or Android versions..